A few months ago (May 10th of this year, to be precise) I had the pleasure of writing about one of my favorite players, Cornetist Nat Adderley in JFASN#108. As a general rule, I don’t like to write about the same artist twice within a 12 month period, mostly to avoid the appearance of being a Fanboy about a particular artist. However, as the old saying goes regarding rules and breaking them, I have decided to throw caution to the wind and take a walk on the wild side of the street and bring you another Nat Adderley classic, almost exactly 5 months to the day after the first. Nat Adderley was, of course, the younger brother of Julian “Cannonball” Adderley and spent his entire working life toiling away in Cannonball’s shadow. He was born on November 25, 1931 in Tampa, Florida and died January 2, 2000 in another Florida town, Lakeland. 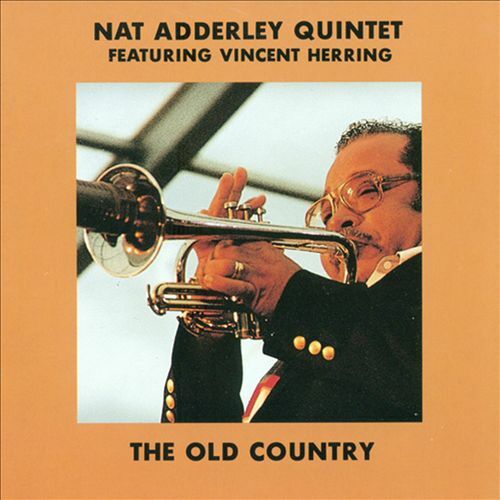 In the time that passed between “On The Move” and “The Old Country” Adderley’s Quintet went through some personnel changes, with the result that Adderley himself is the only performer the two have in common. “The Old Country” consists of nine songs and runs just under an hour total playing time. Two of the songs were written by Adderley; one was written by brother Cannonball; one by Herring; and the rest by various folks whom we’ll learn about as we come to them. The album opens with the title track, one of the two compositions from Adderley. This one opens in a quiet mode with just Adderley and the rhythm section. At about a minute and a half in Herring joins and the temperature and tempo both quickly rise. Before the song ends almost seven minutes later, everyone gets their shot in the limelight. Next we have the Oscar Pettiford classic, “Bohemia After Dark.” This one of flies right out of the starting gate and tears off down the road. “Bohemia” is a great song and the two horns really give it an extra bit of energy. Following “Bohemia After Dark” is “Jeanine,” written by the pianist Duke Pearson. This one is a little mellower than “Bohemia,” but the bass line laid down by Genus drives the guys quickly and insistently forward. Bargad is afforded a nice opportunity to show his stuff, not so surprising I guess since the song was written by a fellow pianist. Adderley himself does a splendid job also. Skipping ahead we come to Cole Porter’s “Love For Sale.” This song has held up remarkably well considering Porter wrote it nearly 84 years ago. (For “The New Yorkers,” which opened on Broadway toward the end of 1930.) The longevity of this song is all the more remarkable in Puritanical America when you consider the character it was sung by was (surprise!) a prostitute… Anyway, the guys do a fantastic job on this, even if the producers pull that nasty turn down the gain trick again to end it. The second Adderley song, “One For Daddy-O,” is up next. This is one of many, many songs that make me struggle to keep from writing that it “burns with a quiet intensity.” Well, crap. I wrote it anyway. Genus on the bass and Drummond on the drums set the pace and the temperature both, and while this song is considerably mellower than some of the others, it definitely cooks! There isn’t much new under the stars to be said about the next song, Ned Washington and Victor Young’s standard, “Stella By Starlight.” Adderley is back on his cornet here, and although the pace quickens some when Herring joins in about two minutes along, this is still a mellow masterpiece, perfect for late at night. The album closes with a song from Nat’s famous brother Cannonball, “Nippon Soul.” This song was first performed by Cannonball (and, coincidentally, Nat) in a series of concerts held in Tokyo in July 1963. I haven’t heard that earlier version so I cannot comment on how true Nat held to his brother’s vision for the song. I can tell you that I have enjoyed listening to this version tremendously. I think you will too. To learn more about Nat Adderley and his music, here are some sites to check out. The folks at NPR have a nice bio of him here. Over on jazztrumpetsolos.com, they don’t mention when he died, but they do have an ample bio. Concord Music Group has a good bio of him also. Hi Al, Great article, change Coronet for Cornet? My personal built-in spell checker must have taken the day off yesterday. I just ran through the article and found and corrected several very obvious goofs. Thanks for pointing that one out!